The London Cycling Campaign's vote to discover which campaign theme its members prefer for the 2012 mayoral and GLA elections, which I covered previously and took part in the promotional video for, ended last week. The option for which I urged members to vote, Going Dutch: Clear space for cycling on main roads in every borough, was the landslide winner, getting an absolute majority of votes cast for the four options in this Alternative Vote poll. The LCC page on the result does not in fact give figures for the votes cast, but I am told that Going Dutch gained 52% of the first-preference votes. I am actually surprised it was not higher. I am not surprised that if you ask cyclists whether they would like high-quality facilities to cycle on, they say "yes". Neither should anybody else be. We’re delighted to have our members directly select our major campaign for the first time. And we’ll be thrilled to lobby the mayoral candidates on your behalf for continental-style clear spaces for cycling on main roads. That’s not to say removing gyratories, getting kids cycling to school and improving neighbourhoods aren’t important, though. 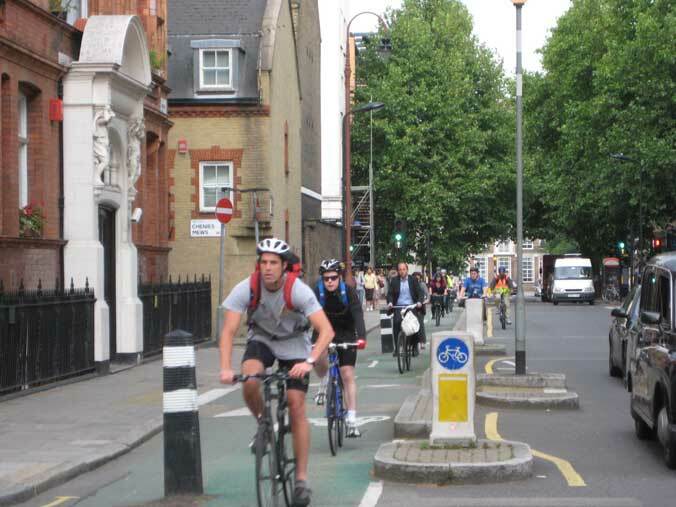 All these issues form part of a progressive cycling vision for London alongside other Dutch-style facilities such as cyclist priority at junctions, reduced speed limits in residential areas, shared zones and ambitious parking facilities. Here he notably both fails to clarify the obtuse "clear spaces" message, and dilutes or further obfuscates it by mentioning a number of other unrelated campaign objectives in the same paragraph – almost as if he were wishing he did not now have to campaign on "clear space for cycling on main roads in every borough", but could go back to the easier stuff about cycle parking. So even the word "clear" has disappeared now (though it is true that the other options have also been re-worded from how they were stated in the vote). So I am not sure where LCC is going on this, and I remain to be convinced that they are now committed to campaigning for an implementation of the Dutch model of urban cycling in London, whatever their members voted for. Old habits die hard, and old campaigners don't necessarily change their beliefs. I made the nature of the Dutch model as clear as possible to viewers of the video, by having it filmed in Torrington Place, with the segregated cycle track in the background – not a perfect "Dutch" facility, as I have discussed before, but the closest to one that we have in central London. So I made it very clear that Going Dutch means the creation of segregated on-road cycle tracks, with appropriate junction designs. And it was very clear from what was going on in the background that this model does indeed work in London, attracting large numbers of cyclists, even when imperfectly implemented over a short stretch of route. The first of the campaign options [children cycling to school] is a target, an ambition. The last two [dealing with gyratories, and excluding traffic from neighbourhoods] are micro-measures, aimed at improving specific situations. Indeed. Residential areas do of course need through motor traffic excluding from them, something that basically is not yet done in the UK. But if we don't have the high-quality routes on the main roads, this will do little good, as people will still not be able to make most of the journeys they need to make by bike, be they school children or adults. They will just be stuck in little, disconnected, low-traffic residential islands (which is what we do have now in many newer urban developments in the UK, which have the so-called "broccoli" street pattern), and a Dutch-style cycling culture will not emerge. Similarly, the "unwinding gyratories" option also embodied a misunderstanding. We don't necessarily want to remove gyratory and one-way systems for motor traffic. What we want is what the Dutch have achieved, which is to make most short journeys faster, more direct and more convenient by bike than by car. So the one-way systems in towns in many cases should stay, and in fact there is case for creating more of them, provided that new, direct, high-quality cycle routes are created which short-circuit these systems. So important features of the Dutch model still seem to be poorly understood in the UK, which is why I am doubtful that LCC will succeed in campaigning clearly on Going Dutch (though I hope I am proved wrong). Meanwhile, the national UK campaign that is clearly committed to Going Dutch will be formally launched in (hopefully) a blaze of publicity and fun activities, in less than a month, in London. So put Saturday 3 September, the date of the official launch of the Cycling Embassy of Great Britain, in your diary now. In fact, put the weekend of 3–4 September in your diary, as the Mayor of London's Sky Ride takes place the following day. More details will be available in due course. And, while we are about it, why not enter the Embassy's poster competition? I too noticed the worrying vagueness with which the chosen lobbying policy has been framed, and the reluctance with which Tom Bogdanowicz seems to have adopted it. "Cycling space on main roads" could simply mean more blue paint. I think LCC need to be very clear about what they are asking for. 'Go Dutch - clear space for cycling' got 58.4% of the vote, nearly four times as much as the next most popular choice. I share your concerns about whether LCC has fully taken on board the message, however. This needs clarifying - but if anything the opposite is happening. I think it's quite clear what people want. But it also looks like they may be told they had asked for something entirely different. I have no brief to defend the LCC, but I don't think you are being entirely fair. Firstly, I think it was you yourself who quoted from a politician (a Libdem?) that you should have your big plans ready, just in case things change more than you had ever imagined (like being in a coalition with the tories, for example) but meanwhile should continue to have more modest ambitions that work in the world you currently live in. Secondly, 58% of respondents may have voted going Dutch, but that means 42% didn't, and the LCC has to take proper account of the views of its membership, including the minority. Thirdly, vague and woolly and compromising though Tom's words sound, the acid test - what is actually pitched at the candidates - is yet to come. Absolutely fine to challenge him and hold his feet to the fire, so he doesn't water it down, but through encouragement (if necessary in the style of Voltaire's Candide) rather than censure. Re your picture: what are those bollards doing in the middle of a cycleway? The Dutch would never stand for that. "Re your picture: what are those bollards doing in the middle of a cycleway? The Dutch would never stand for that." "not a perfect "Dutch" facility, as I have discussed before"
Simon - probably stopping drivers using them for "emergency" parking, a frequent occurrence on road side separated bike lanes in Manchester. John is spot on - that's exactly why they were put in, and with the full support of the Camden Cycling Campaign. I believe we'd need a substantial and sustained improvement in (rapid) enforcement action (towing away) against motorists who obstruct such facilities before we'd be able to risk taking the bollards out. Especially as he is apparently chair of LCC's campaigns committee. It does seem as though they're not entirely on board with their own members on this. Oliver Schick is not chair of the LCC campaigns committee, that is Mustafa Arif, but he is currently on the Board of LCC. I have discussed this subject with him many times, and our views are far apart. I believe most of LCC is moving in the right direction, however.